This mega-kit from Sephora boasts 193 products. Their lip products, on the other hand, I like. The quality has generally been very good, and my guess is the 84 glosses in the palette will be similar to their sheer lipsticks in opacity and texture. Their liners are good as well, but I cannot speak about Sephora's mascaras as I do not own any yet. Format-wise, I prefer not to mix powder and cream products as the creams tend to go off or get moldy much faster than powders, which means you will need to either dig out and clean out the lip pans when that happens, or (if you're a bit of a clean-freak) throw the whole kit out. The other thing is that none of the shades are numbered or named, and Sephora does not say if the shades are drawn from their regular line, so if you fall in love with a few of the items within, you may not necessarily be able to find a replacement in full size. Variety-wise, I'd say this definitely gives you lots of colors, but not in textures. As mentioned, Sephora shadows don't tend to highly-pigmented, so you won't be able to choose between sheer and strong shadows. Also, for lip products, what is listed are all glosses. I would have loved to see a mixture of glosses and lipsticks, especially as Sephora produces some really good, creamy opaque lipsticks. Still there are some REALLY nice-looking pinks and corals in this baby. You're a makeup maniac, and you collect everything that can be used to color your face. 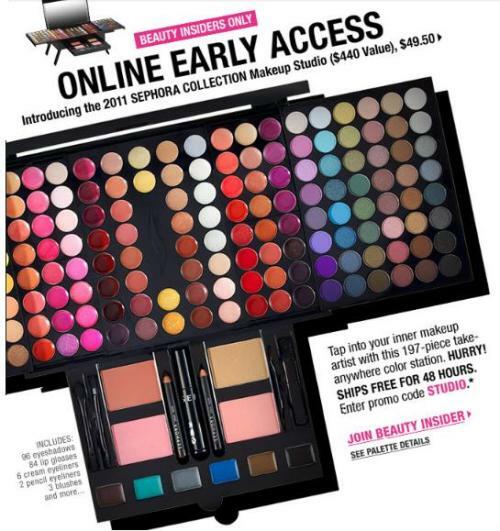 This is not a new product as Sephora released it (and multiple variations of it) previously. If you've bought one, what are your thoughts, and would you recommend it? thanks for the detail review! i received quite some bad reviews about this color eye shadow and made in china etc. the staff actually tried few colors on her hands, i find it quite pigmented but not too sure how long the e.shadows lasted..
Hi aqlim, actually it depends on the company and how much attention they pay to the quality of the eye shadow formula. A lot of the brands made in China (e.g. NYX, Coastal Scents and BH Cosmetics) have pretty good, highly-pigmented shadows. The Sephora stacks are cute and fun, but not actually that cheap when you see the actual size (smaller than the pictures look). It has no lipstick, but that means you don't have to worry about your lipstick going bad before you finish your eyeshadows and blushes!